Direct to Consumer ecommerce brands have invested a lot of time and effort to tell a unified story with great success. Here's what they're doing right. The integration of content & commerce remains a central priority throughout the creative process. The stories and experiences that brands convey with content form the foundation for an emotional connection between brand and consumer. According to research from Capgemini, 70% of consumers with high emotional engagement spend up to two times or more on brands they are loyal to. It is important that those building the brand experiences and those building the website are aligned in their understanding of how to conceptualize and execute an effective e-commerce experience. Know the difference between an editorial site and an e-commerce site. Your goal is to get people to purchase. Consider using editorial pieces and media rich content in digital marketing campaigns to draw users to the site. Once a user lands, it’s all about making a purchase. If you do utilize rich content throughout the website, make sure it leads to product pages. Your lookbooks should be shoppable and have products tagged. Hill City does a great job sharing lifestyle stories and highlighting the collection of products featured in the post. Pick one aspect of your mission or values to highlight on the homepage. So you ethically source materials, have a denim recycling program, and make apparel for all body types? Every piece is important to your brand story, but find the right place on your website to tell those stories. It might be a “Founder Story” page that details the discovery and design of an innovative product. 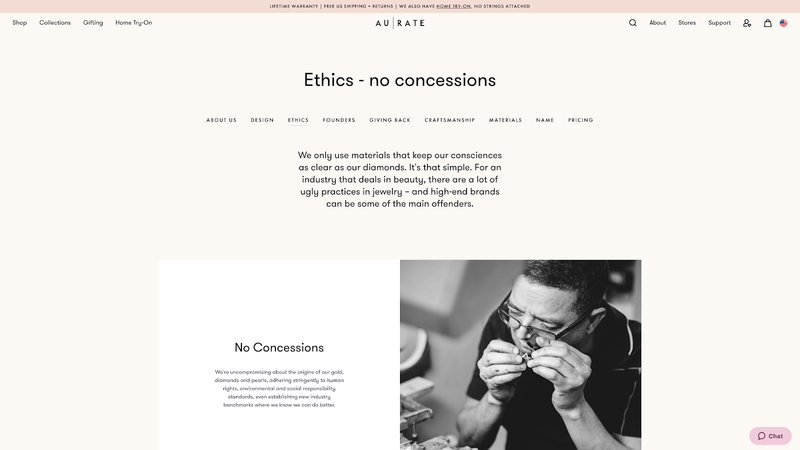 Below, you can see how Aurate organizes different aspects of its brand story with a sub-menu on the About page. 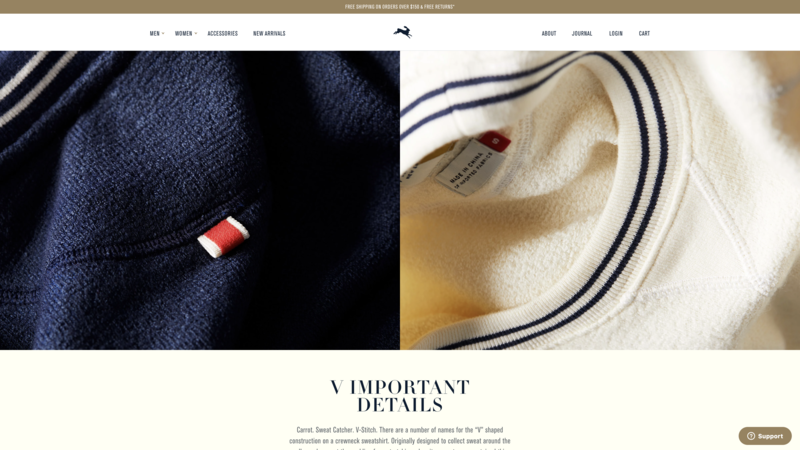 Create a purposeful homepage by conveying the emotion of the brand in the context of its products. 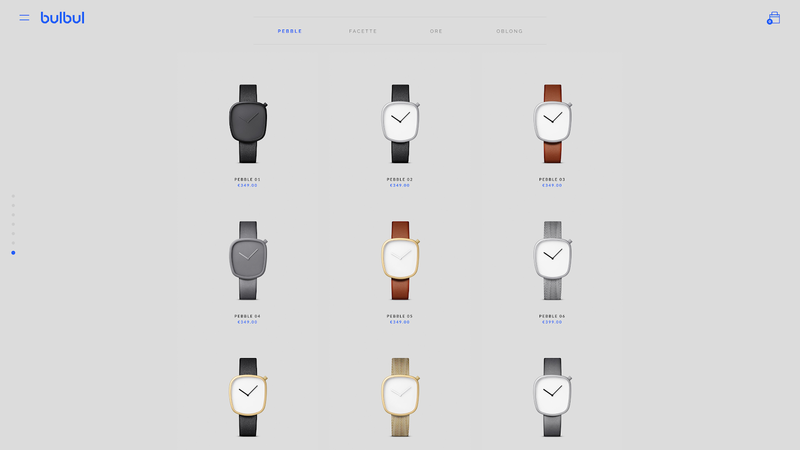 Bulbul is known for its minimal and streamlined watch design and the website matches that exact aesthetic. Present the user with an immediate opportunity to view, shop, and add products to a cart. Reduce clutter by personalizing the homepage for users, based on geolocation and other customer data. You can use a technology partner like Dynamic Yield to segment audiences visiting the site and present targeted discounts and recommended products on the homepage. Less is more with personalized shopping (30% of people completed purchases when sampling a smaller range compared to just 3% who sampled a much larger range). Ensure a clear path to checkout by establishing continuity between product listing pages (PLP) and product detail pages (PDP). For example, when a product color is selected on the PLP, the same color is pre-selected after clicking through to the PDP. There’s also an option to add a product directly to the cart from the PLP. Have a unified design language across all channels. When a shopper goes from an Instagram ads to the mobile or desktop site, there should be visual and tonal continuation of the customer’s journey. The foundation of your guidelines are built on typography, colors, icons, etc. Check out Airbnb’s article on maintaining guideline standards. Create and curate unified photography throughout the site. Almost half (47.0%) of U.S. online consumers rate high quality product images as the most influential factor when considering a product purchase from a specific brand. Photos should be consistent in quality of image, product background, and shot variety. 22% of returns are due to a difference in the product appearance when compared to what the website displayed. Take notes from Tracksmith on capturing the texture and weight of a fabric. Write copy that retains the same tone throughout the website. If copy on the homepage is humorous, product descriptions should match that. Keep product information in the same place (care instructions, sizing charts, return policy). 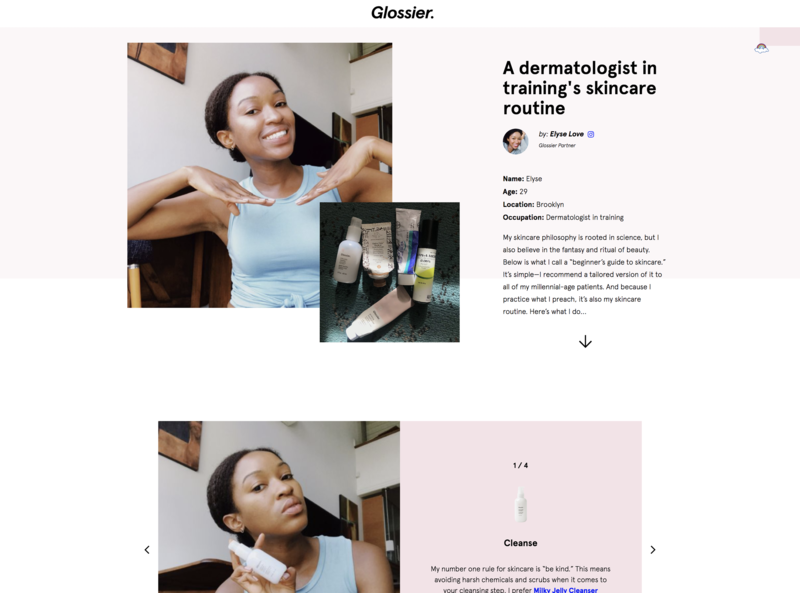 Glossier features "real life routines" on its website. The posts retain the same format and guidelines, even though the content is different from one customer story to another. Thoughtful design often means making the right sacrifices to tell a better brand story. Your brand is doing things and selling wonderful products and it can be hard to distill that into a clear message and user experience. Choose the right content to display in the right places; focus on the right blend of editorial content and effective commerce. It is more important than ever for customers to identify with your brand’s vision and values. However, once you have their attention, the website must be optimized to take them from discovery to purchase. As CEO & Founder of Verbal+Visual, Anshey is dedicated to brands whose purpose goes beyond commerce. In partnering with brands who combine commerce with care, Anshey's purpose is to craft digital experiences which make consumers feel pride, passion, and purpose.